It is only when something begins to fall apart that we fully appreciate how it has been put together; a damaged object tells the story of manufacture, use and deterioration that a pristine garment never will. For this reason it is often the role of the conservator to record such historical evidence, glimpsed through soils, stains and areas of loss, prior to supporting the damaged portion. My conservation placement last summer was at the Royal Albert Memorial Museum and Art Gallery in Exeter, famed for its extensive collection of nineteenth century costume and accessories. 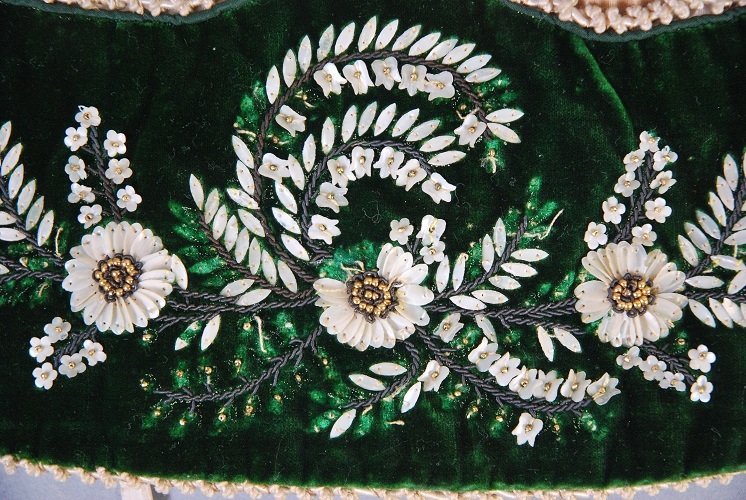 I was tasked with the cleaning and provision of internal support for a small early nineteenth century drawstring reticule of moiré silk and green silk velvet form, embellished with metal wrapped threads, nacre work (shell work) and gold beads. Beadwork embellishment of accessories using embroidery stitches became popular during the early part of the nineteenth century when, ‘the simplicity and plain, light colours of dress fabrics gave accessories an added aesthetic importance that went beyond that of function.’(1) Research into this small purse led to my own ongoing interest into the history and techniques for underdrawing on textiles. This object was, without doubt, exquisite in its craftsmanship, however what piqued my curiosity was not the fine passementerie, nor the intricacy of the embroidery, but a white, grainy deposit noted under the nacre work, visible where the shells were missing. Initially this deposit was thought to be some sort of deterioration product; perhaps a finish on the shell beading which had begun to decompose with time. The term ‘underdrawing’ is one more commonly associated with painting, referring to the artist’s underlying sketch applied roughly to the canvas surface prior to application of the paint. I was less familiar with its usage in textile terminology, assuming instead that most unsightly stains tend to be the result of wear, use or the ravages of time. I later discovered from subsequent conversations that this deposit was in fact the crusted remains of an early textile underdrawing transfer technique known as ‘prick and pounce’. The design was first drawn onto paper, then perforated (or pricked) along the outline. This image was laid over the fabric and transferred onto it by pummelling (pouncing) a dusty mixture through the perforations. The prick and pounce technique had been employed by the amateur embroider for many decades prior to this period, more commonly for application on fine linen using a combination of chalk and charcoal to create the outline. (2) The use of the technique on piled fabrics led to experimentation with a wide range of transfer materials including starch paste and cuttlefish whitening, presumably to encourage the design to adhere to the raised velvet surface. 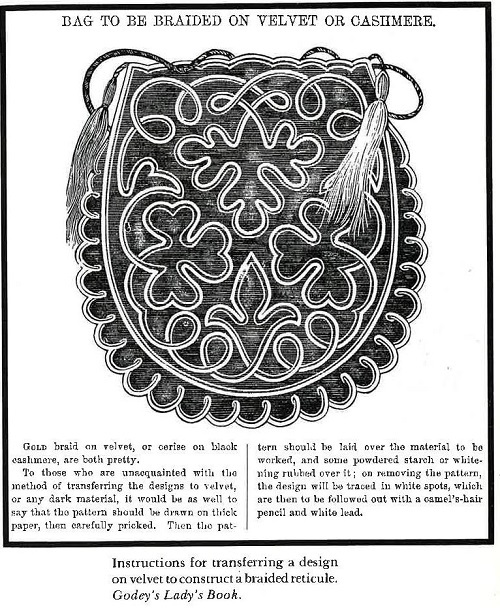 (3) The grainy, white deposits visible on this reticule are the remains of this technique, each lost shell exposing a little more of the design below. This is one of the many reasons why historical understanding plays such a vital role in textile conservation treatments. The newly exposed technique enhances our understanding of how the purse has been constructed, suggesting perhaps that is was bought as a plain item then adorned with shells and beads by its new owner to resemble the more fashionably ornate examples of the time. No longer a thing of pristine beauty its value today lies in what it lacks. It is therefore the role of conservators, not to restore it to its former glory but to prevent further deterioration so that it can remain a record of a dwindling technique for future generations. My next blog post will look at twentieth century transfer techniques and consider them in relation to their prick and pounce predecessor. (1) Wilcox, Claire. Bags. London: V&A Publishing, 1999. 53. (2) V&A Teachers’ Resource. ‘Plant Motifs.’ http://www.vam.ac.uk/content/articles/t/a-teachers-resource-plant-motifs/. Accessed June 15, 2015. (3) Ettinger, Roseann. Handbags. Pennsylvania: Schiffer Publishing, Ltd., 1991. 13. 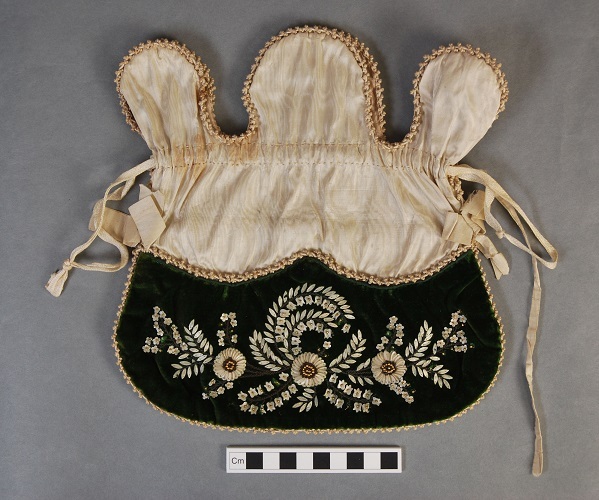 Nacre Work Reticule after Conservation © Royal Albert Memorial Museum and Art Gallery. Nacre Work Reticule Detail © Royal Albert Memorial Museum and Art Gallery. Nacre Work Reticule Conservation in Progress © Royal Albert Memorial Museum and Art Gallery.